It’s no secret that vocalists sometimes need a little assistance to hit the perfect pitch. Even the most talented singers can sometimes hover, sharp or flat, around the note they’re trying to sing. An engineer might also have an otherwise perfect take that they’ve comped with just a hint of “pitchiness” here or there. In these instances, vocal tuning can be applied to smooth out any rough patches in a performance. Real-time vocal tuning software has been around since Antares introduced Auto-Tune in 1997, and is accepted as an appropriate means of giving performances an extra nudge in the right direction. Auto-Tune is still one of the most well known and popular forms of pitch correction, but there are plenty of other options as well. There is a fundamental difference between pitch shifting and pitch correction, and it has to do with how the human voice forms specific sounds. When we find the correct note and glue the vocal take to it, we’re using pitch shift. The result is very noticeable, creating the Auto-Tune/robotic effect we’ve become accustomed to in modern music. With pitch shifting, the overall harmonic structure of the voice is overridden, creating an audible and unnatural change. Pitch correction, on the other hand, accounts for the overall harmonic structure of a vocalist. You’ve probably seen the “formant” parameter on pitch correction plugins you’ve used. Formants specifically refer to peaks in the harmonic spectrum of a sound like the human voice. Formants tend to be associated with, but not necessarily equal to, a resonance from the source. Because of this, they stay the same even when the fundamental pitch is changed. Formants shape the overall characteristics and tone of someone’s voice, and don’t change from note to note. Pitch correction software accounts for the harmonic structure of individual voices, making it a better choice for natural sounding vocal tuning. Most of us probably aren’t terribly interested in the technical aspects of vocal tuning. And really, we don’t have to be. As long as we know how to use our software to achieve the desired result, we know all we need to! That being said, there’s some interesting information behind how pitch correction operates. At the most basic level, vocal tuning relies on a form of “phase vocoding.” A vocoder analyzes the amplitude of frequencies in a voice and determines the overall “shape” of a vocalist. The shape then controls a set of filters in the vocoder which are applied to an alternate signal. So, in traditional vocoding, the voice acts as a modifier of a wave shape or sound. In pitch correction, the voice works as a controller for a pitch shifted version of itself. The general principle behind traditional vocoding is responsible for the way vocal tuning software works. Now, with the introduction of Auto-Tune Pro, it’s more versatile and easy to use than ever before, thanks to a totally redesigned interface and powerful new processing, editing, and navigation features. With Auto-Tune, users have the option of running it as transparent or as heavy-handed as they’d like. Many engineers have noted that Auto-Tune adds a distinctive color to the signal, even when Retune Speed isn’t set to “T-Pain.” Whether it suits your taste is of course up to you, but the plugin is still one of the most widely used forms of pitch correction in modern music. Better-sounding and more versatile than any other pitch correction processor, Waves Tune will get your vocals back on track. The Waves Tune interface has 3 timeline modes, including bars/beats, samples, and minutes/seconds. The edit graph window includes a waveform overview, timeline, piano roll, and pitch editor. When you need to precisely edit a recorded performance, this is an extremely handy tool. Waves Tune Real-Time is designed to help vocalists stay in key while performing, whether live or in the studio. It functions similarly to Auto-Tune’s “Auto Mode,” for real-time pitch correction. Real-time pitch correction is particularly helpful for making vocalists feel confident, allowing them to focus more on the emotive content of a performance. In the studio, we tend to get the best takes when the artist feels comfortable and confident. A quick glance the Real-Time’s interface shows it’s pretty easy to use. You can of course pick the desired key, or even input a reference tone from a MIDI device. The amount of correction can be altered as well, depending on how transparent or not you’d like it to run. Melodyne is arguably some of the most detailed pitch correction software available. Like Waves Tune, it’s designed for use on pre-recorded takes of vocals, or anything else for that matter (noted metal producer and engineer Andy Sneap has described how he uses Melodyne frequently on bass guitar). Its algorithm detects three different types of pitch for each inputed note, including pitch center, modulation, and drift, for precise control. 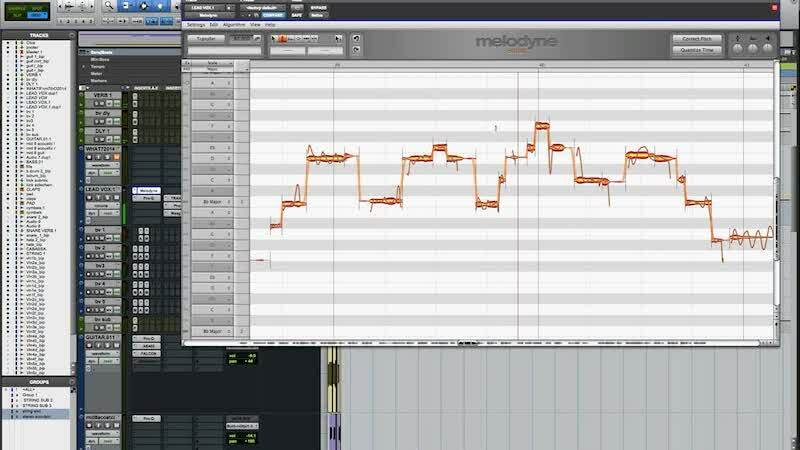 With Melodyne, users can correct pitch, timing, and amplitude for vocal tuning. You can even create artificial vibrato, extend or shorten notes, and do just about anything else you can think of. That’s just scratching the surface. For the most advanced control over vocal tuning and pitch correction, you can’t go wrong with Melodyne. Tags Mixing Vocals Pitch Correction Vocal Tuning vocals What is Vocal Tuning?